Azure Bot Service provides tools to build, test, deploy, and manage intelligent bots all in one place. The free eBook by Anand Raman and Wee Hyong Tok can be downloaded from Download the Developer’s Guide to Building AI Applications after providing your name and email address in the short form on the web page. Afterwards, you can download the Developer’s AI Guide. The book was published by O’Reilly and is available in PDF format. 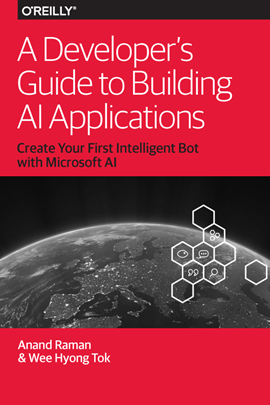 Create your first intelligent bot with Microsoft Artificial intelligence and this free Guide. The book consists of 52 pages starting with an Introduction, followed by the Intersection of Cloud, Data, and AI, and informs about the Microsoft AI platform. The next chapters is about a Bot architecture, conversation flows, working with Microsoft’s Language Understanding service (LUIS) , the Bot brain abstraction layers, Data contracts and closes with information about building an Enterprise Bot App. The eBook is not a step-by-step tutorial, but a guide to AI and Microsoft’s AI platform showing concepts and flows. As the authors write, "There’s no field that will be left untouched by the transformational power of AI". So, developing a bot "is a relatively easy entry point into AI and in the process we highlight resources and links to help you dig deeper". The book is helping enable systems of intelligence and shows an introduction into (conversational) AI. An interesting read!